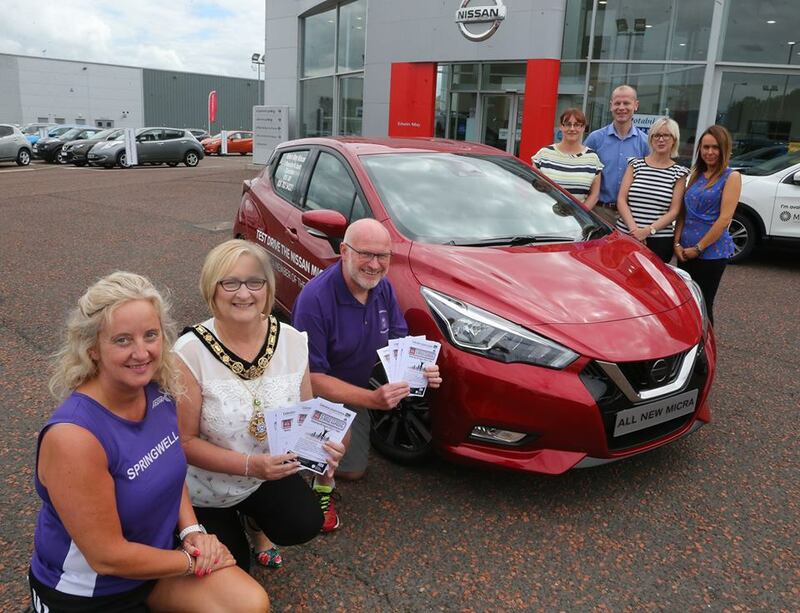 Organised by Causeway Coast and Glens Council in association with Springwell RC, and sponsored by Lacpatrick Dairies, the Lacpatrick Milk Run attracted over 150 runners to the Joey Dunlop Leisure Centre in Ballymoney on Friday 27th July for this very popular 5 mile road race. Starting at 7.30pm in perfect running conditions the race provided the highest standard of competition, with the early pace being set by Emmett McGinty (City of Derry AC), Steven McAlary (Springwell RC), Stephen Nicholson (PACE Running Club) and Christopher Fielding (Unattached). In a closely contested race it was Steven who eventually established a lead which he maintained to win in a time of 26.34. Christopher was second in 26.45 with Emmett completing the podium in 27.02. In the ladies race it was the inform Gemma McDonald (Ballycastle Runners) who led from start to finish, winning in a time of 30.24 and 17th overall. Karen McLaughlin (Springwell RC) was second lady and 38th overall in 33.20 with Leanne Sands (Acorns AC) third and 41st overall in 33.35. The 3.9 miles and 2680 feet of elevation weren’t the only challenge for the competitors at Saturday’s Slieve Bernagh Mountain Race. The thunderstorm that struck during the latest round of the NIMRA Championship produced such torrential rain that the Mourne Search and Rescue Team had to be deployed to assist some of the runners from the mountain. Thankfully everyone was quickly accounted for and safely delivered to the finish. Keeping ahead of the worst of the weather the three Springwell RC representatives at the event all produced excellent performances in challenging conditions to win their respective age groups. Oisin Brennan finished 6th (1st M23) in 54.00, closely followed by Alex Brennan in 7th (1st M45) with a time of 54.20. Colin Brennan completed the hat trick of age category wins in 18th (1st M55), crossing the line in 1.03.26.